Instructors have the ability to penalize their students for submitting assignments, quizzes and tests late through our Late Penalties feature. This feature was designed to encourage students to keep working without worrying about reducing their credit - students can’t lose credit they’ve already earned when working on a late assignment! 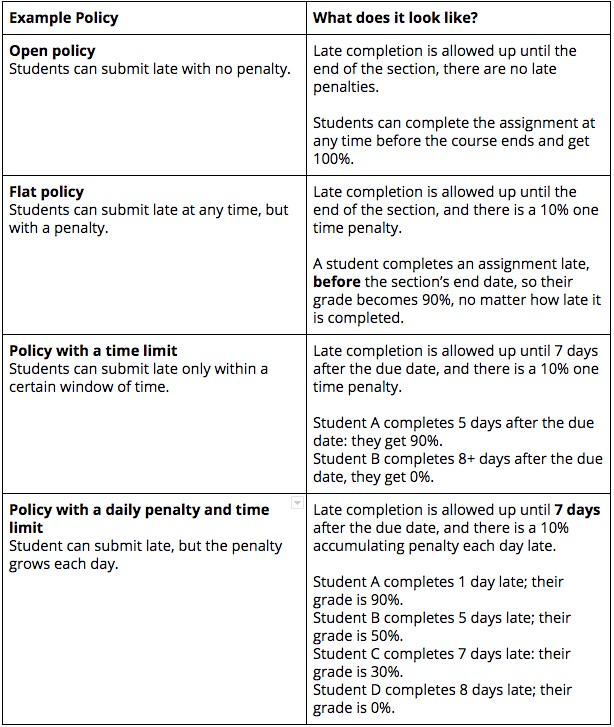 You can enforce Late Penalties at the parent course level, which will apply to all sections. To begin, navigate to your Course Settings page. Scroll down to the Grading section. 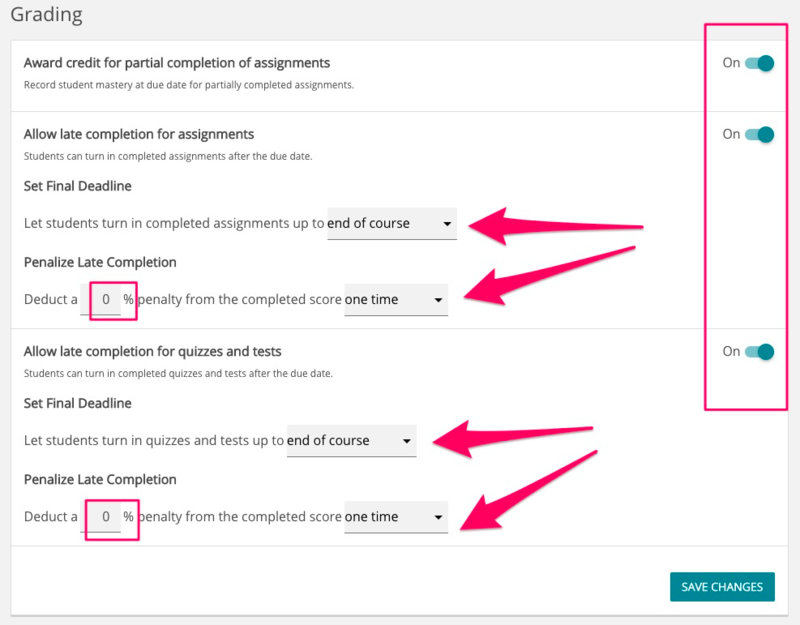 Ensure that you toggle on Allow late completion for assignments. You now have the option to set your Final Deadline, which is the number of days after the due date you’ll allow students to submit their work. You can choose 1, 2, 7, or 30 days late, or allow late completion up to the end of your section. You can also Penalize Late Completion, which is where you can choose the percent deduction from your student’s completed score. This can be a one-time penalty, or a penalty for each day late. You should choose the percentage deduction you feel is best for your students. Students cannot lose credit they have already earned before the due date. 3. Updated grades are available in your Learning Management System gradebook, if you use one, and in your CSV export. 4. You can still give students extensions with late penalties! If you give a student an extension of two days, they will have until two days after end of your allowed completion date. 5. If you change your Late Penalty policy after student grades have already been recorded, any grade changes will be applied retroactively. For example, if you decide to remove a late penalty, students with grades that were previously penalized due to lateness will be updated to a potentially higher grade. Read below to learn more about a few policies you can use in your course.